"The forces of life and destruction? But aren't they the same thing? One destroys the other so it can live." A tense situation is under way. A young radical has taken a member of Parliament hostage, threatening him at gunpoint. In a small, dingy room, the two wait for the authorities, who will undoubtedly attempt to offer sweet nothings to pacify the threat. Yabuike (Koji Yakusho) is a seasoned cop, and a fine shooter; if he has to use force, he has the ability to do so with speed and accuracy. He saunters into the room with a sense of routine, and begins talking. A moment of vulnerability prompts the officer to draw his weapon, but he doesn't fire. Instead, the cop considers the criminal's request: "Restore the rules of the world." When Yabuike exits the building to deliver the message to his backup, shots are fired; the hostage is dead. This tragic lapse costs Yabuike dearly. He is on the outs with the department, and they eventually ask him not to return. In an attempt to find solace, the haggard officer wanders out into the wild. Among the forests of Japan, not too far from the concrete of Tokyo, Yabuike is thrust into another storm. A group of environmentalists are investigating why a forest is dying. Some blame a gnarled, sickly tree in the middle of a field; dubbed "Charisma," it is a rare breed, one that distributes a deadly toxin from its roots. The forest officials can't cut it down; if they did, they'd be risking bodily harm from Kiriyama (Hiroyuki Ikeuchi), a young man who was charged with the tree's defense. He lives in an abandoned sanatorium, and offers Yabuike shelter. During his reprieve, the cop meets another passionate defender: Jinbo Mitsuko (Jun Fubuki), a botanist who has her own opinions on the health of the forest. Life and death are inexorably intertwined in this primal place, and before any measure of peace can be gleaned from the natural setting, the cop must decide who can be trusted, choose sides, and take action. Like the tree that plagues these characters, Kurosawa's Charisma is a rare, inexplicable film, filled with far more questions than answers. According to Tom Mes' astute essay (found in the insert), this is not uncommon for director Kiyoshi Kurosawa, whose work, including S�ance and Cure, walks a fine line between allegory and bafflement. Clearly, everything in this film symbolizes something, and upon closer examination, we can begin to uncover its messages. His themes are primal, dealing with life and death. Life is by nature both flourishing and destructive; to stay alive, one must consume, or in some cases kill. That is the rule of the world. Is it right? Perhaps not. Can't both survive? This is unclear, but Yabuike will not stop until he finds something resembling an answer. This genre-defying tale is certainly intriguing and, at times, downright haunting. Yakusho Koji, whose long brown coat is reminiscent of Harrison Ford's replicant hunting gear in Blade Runner, is the epitome of a fish out of water here, and his performance delivers. The supporting players are quite catatonic and less developed; they seem more like presences generated by the forest than human beings. A very Japanese outing, this film circles about, cutting between long, drawn out moments of chatter, which rarely stray from a wide master shot. These images are sometimes evocative, but they usually meander with a Tarkovsky-esque aimlessness. Most of the film distances the viewer, making the events seem less immediate, and as a result, less thrilling. This is ultimately Charisma's downfall. A strange juxtaposition of genre elements, including horror, thriller, and ecological fable, creates an intriguing fabric, but Kurosawa doesn't seem to know how to present his story, nor does he seem to be willing to help the audience decode its more inexplicable moments. This stylistic indecipherability and distance, plus a lack of taut emotion, amounts to a film that rarely involves. It's a shame Kurosawa's approach does not fully tap into the potential power of this odd tale. Image Transfer Review: Home Vision is the victim of some shoddy source material. A superb studio that consistantly delivers the best possible product, Home Vision is sometimes forced to work with poor elements. In this case, it seems Nikkatsu only provided a nonanamorphic, letterboxed 1.85:1 transfer. The image here is still good, considering, showcasing decent color and detail. The image is relatively soft, though, and blacks can look grayish. Audio Transfer Review: The Dolby 2.0 Japanese mix is quite sparse, and appropriately so. There is some peculiar, almost comedic music that crops up here and there. This is a fine transfer of an average soundtrack. Extras Review: I should begin with the cover art and menu design, which are quite stunning in their expressionistic use of botanical life. Bravo to the design team on this one. 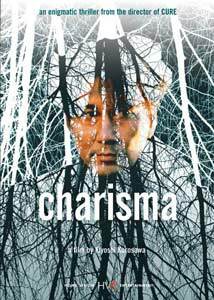 The extras include a recent interview with director Kiyoshi Kurosawa (05m:51s). His comments, which cover the film's genesis and some production challenges, are low key, interesting, though somewhat repetitive. You will also find a making-of documentary (30m:01s), consisting mostly of behind-the-scenes material, including a look at the film's special effects. We get to see raw on-set footage of pivotal scenes from Charisma, intercut with the final sequence from the film; this is a revealing, clever presentation that has some entertaining, candid moments with the cast and crew. Finally, trailers for Charisma, S�ance, and Cure (all available from Home Vision), plus an insert with a helpful essay by Tom Mes round out the extras. Kiyoshi Kurosawa's blend of eco-thriller, horror, and existential allegory is certainly a fascination, but the drab stylistic choices gut the story of its potential power. Still, there are some haunting themes and moments to uncover. Home Vision's disc is as good as it can be considering the elements available, and includes some solid extras.